Every employer wants their employees to achieve greatness. You invest time and resources to recruit and train people, and it’s in every organization’s best interest to create an environment where their employees can thrive. Without employees succeeding on an individual level, the business as a whole can’t succeed either. It’s one thing to acknowledge the importance of employee success and quite another thing to enable it. This is a challenge that organizations of all sizes, locations, and industries face. Achievers recently conducted a survey of the North American workforce and found that there is a serious greatness gap. Employees are disengaged at work, and this prevents them, as well as their employers, from reaching their full potential. It’s time to bridge this gap. Successful employees are engaged employees, and meeting basic needs of compensation and resources is only the foundation. Beyond that, the requirements are less tangible. Employees need recognition, direction, inspiration, and purpose. They also need the 3 M’s of Mastery, Membership, and Meaning. American employers are clearly falling short of fulfilling these requirements, as employee disengagement is a pervasive problem. According to the Greatness Report, 51 percent of employees are not happy at work, and about the same number expect to work for a different employer one year down the road. Part of this disengagement comes from a lack of purpose, which is a critical part of employee engagement. A sense of purpose ignites intrinsic motivation, but employers are failing to instill it in their employees. The Greatness Report found that 61 percent of employees do not know their company’s cultural values and 57 percent are not motivated by their company’s mission. Company culture is also a significant problem, with just 44 percent of employees indicating that they like their company’s culture. Part of this problem stems from issues with managers, who are responsible for conveying core values and cultivating an environment that supports company culture. The old adage that says that people join companies but leave bad managers rings true here, and only 45 percent of employees trust their company’s leadership. Why? Well to start, 60 percent of employees reported not receiving in-the-moment feedback from their managers. In addition, 53 percent of employees don’t feel recognized for their achievements at work and 47 percent don’t feel recognized for progress towards achieving their goals. All of these factors contribute to employee disengagement and limit their success. 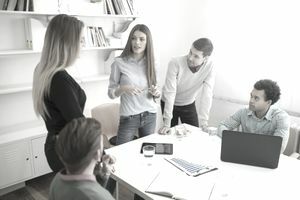 The good news is that you can remediate these issues with two simple and straightforward steps: recognize your employees and educate them about the company’s core values. Research shows that recognizing team members has a dramatic effect on performance. A study by Bersin and Associates found that organizations where recognition occurs perform 14 percent better on employee engagement, productivity and customer service than those where recognition does not occur. Moreover, companies that actively recognize employees have 31 percent lower voluntary turnover rates than companies that do not. Minimizing turnover is becoming a growing concern for employers as their workforces become increasingly dominated by Millennials, who are known for job hopping. Churn is expensive. It is human nature to seek and respond to praise. Recognition is so important because it makes employees feel valued, and on a more basic level—noticed. It reinforces the fact that their contribution matters and expresses gratitude for their hard work, which encourages them to continue working hard. Recognition reinforces positive behaviors and inspires every employee to perform at their best. It helps cultivate trust between employees and their managers, as well as loyalty, which is why recognition and turnover have such a significant link. However, all recognition does not have the same effect. A good job once a year has a negligible effect. The other 364 days a year, the employee is wondering how she is doing and if her work is appreciated. For recognition to reap the strongest results, it needs to be daily, or even hourly, and happen in the moment. When an employee does something great—whether it’s delivering an amazing presentation, helping out a colleague, closing a sale, or coming up with a great idea—that is the opportunity to recognize their achievement. 72 percent of employees say their performance would improve with more specific and constructive feedback. Additionally, public recognition is especially powerful. The above survey by Brandon Hall Group revealed that 82 percent of organizations with social recognition platforms enjoyed higher revenues and 70 percent saw improved retention rates. The second major driver of the Greatness Gap is the lack of a clearly defined, or understood, mission and core values. Culture is the glue that holds an organization together. If you hire employees that don’t fit in with your company’s culture, believe in its mission, and uphold its core values, then you will have an uphill battle getting them to succeed. A well-articulated mission helps employees understand why they come to work every day and do what they do—it provides purpose. Employees that feel their work is meaningful are more inspired, motivated, and engaged. Core values help employees understand what types of achievements and behaviors are rewarded. It’s a guideline of sorts for how to succeed within the organization. For example, if putting customers first is a core value, then every employee, whether they are in sales, support, or on the design team, approaches their work with that lens. Most companies have mission statements and core values. The issue is that they aren’t woven into the fabric of the organization, so they have no weight. Sticking them up on the wall or on a website is not enough. Upholding the mission and instilling core values requires clear communication, as well as recognition of those values. This reinforcement will highlight to employees how their work fits into the bigger pictures, as well as strengthen their alignment to a shared culture of doing the right thing. Regularly recognizing employees and educating them on core values will have a dramatic effect on employee satisfaction, engagement, and productivity. Try recalibrating your company culture with greatness in mind, and the results will amaze you.